All the pens listed on this page are in Mint, unused condition unless otherwise stated. 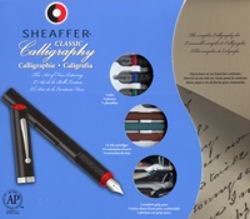 The Sheaffer Calligraphy Set comprises 3 pens with italic nib sizes Fine - 0.8mm, Medium - 1.3mm & Broad - 1.8mm. The set also contains 14 Sheaffer cartridges in various colours, a tracing pad and instruction booklet. The Targa range was first introduced in 1976 and spanned two decades. It was an innovative design at the time and has since been much copied. The pen has a nice solid, reliable feel to it, the clip, for example, being one of the most durable you will find on any pen - anywhere. 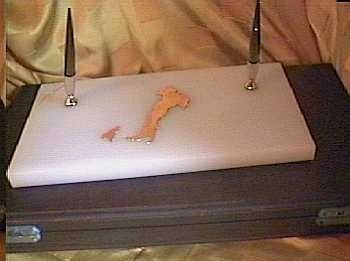 The nib is based on the old Triumph design, but much improved. All Targas are convertible and can be filled from a bottle or take cartridges. In 1982 a new range of Targa's was introduced with ladies in mind. This was known as the Slim Targa, and with a few exceptions was made in the same patterns as the standard Targa.I have always considered the Targa to be one of the most reliable pens Sheaffer ever produced. It is not only a good pen for everyday use, but is destined to become a future classic and is already very collectible, not least because of the vast range of patterns and models that have been available - over sixty. All the pens listed here are mint, unused, with 14ct gold nibs and come complete with converter units. All are boxed, although not necessarily in their original box. Slim Matte Black. Mint but selling without a refill. This magnificent Sheaffer fountain pen and ballpen desk set in white Onyx is in absolutely mint condition. The fountain pen has the Triumph nib in medium point and is a convertible filler. An additional point of interest is that it comes with a brass plate outline of Italy which can be optionally fixed to the stand. The unit comes in a polished wooden box. However, the box has obviously been stored for some time and is not in pristine condition. Very heavy item, so extra postal charges will apply. Maroon. Original chalk marks still on the barrel. Matte green with gold trim.